In Brooklyn where I live, the mosquitos are brutal in the summer. I’ve tried everything to fight them: Mosquito-repellent candles, bug zappers, those vaguely snake-oilian machines that use propane to try and trap insects. None of it worked. I’d resigned myself to simply never sitting in my backyard or front stoop for the months of July or August. Then I read a clever solution in yesterday’s New York Times: An oscillating fan. If you set an oscillating fan near where you’re sitting, it prevents mosquitos from clustering. Why? An incredibly simple reason: They’re not strong enough to fight against the wind. The author of the article, William Broad, discovered this nifty hack while visiting with some friends. They set out a fan, nobody got bit, and Broad, amazed, asked them: Where had the idea come from? As we left, I asked our hosts about the fan idea; they credited a mutual friend at the barbecue. He, in turn, paid tribute to a friend of his: Frank Swift, president of Swift Food Equipment Inc. in Philadelphia. I love it: He imagined himself in the position of the mosquito. This is not something we’re often told to do when brainstorming a solution to a problem. Sure, we’re frequently told that it’s important to empathize with the humans; they’re the reason the problem is being solved, right? But we’re rarely told that a crucial imaginative task, a critical bit of cognition, is to put ourselves in the position of a nonhuman thing, and see the world from that perspective. Then suddenly it hit him, the key to the entire problem. Einstein recalled, “A storm broke loose in my mind.” The answer was simple and elegant: time can beat at different rates throughout the universe, depending on how fast you moved. Think like light, think like a mosquito. This idea — how does our world appear to things around us — isn’t an entirely new idea, obviously; it’s part of Bruno Latour’s actor-network theory. My personal favorite exploration of it is Ian Bogost’s fun, recent book Alien Phenomenology, Or What It’s Like To Be a Thing. Anyway, now I vow to start approaching problems by imagining the mental state of the inanimate objects involved. 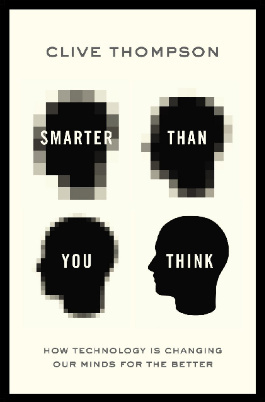 I'm Clive Thompson, the author of Smarter Than You Think: How Technology is Changing Our Minds for the Better (Penguin Press). You can order the book now at Amazon, Barnes and Noble, Powells, Indiebound, or through your local bookstore! I'm also a contributing writer for the New York Times Magazine and a columnist for Wired magazine. Email is here or ping me via the antiquated form of AOL IM (pomeranian99). All text on this web site is licensed under a Creative Commons License. I've started a new blog -- this one is officially retired!